Here’s a reprint of my list in 2014 with comments added on how I fared sans the preface. I actually didn’t ever go back to this list during the year (which I hope won’t happen to my #ThingsToDoIn2015), but it’s refreshing to look back and chime in now that the year it was meant to be for has ended. 1. I will be kinder to myself. Charity, as they say, begins at home — but we always tend to forget ourselves. After two years of self-flaggelation and of thinking the worst of me, I think I’m ready to move forward knowing I have learned my lesson from my failings and am a better person for it. Kindness begets kindness and I hope to be able to give more of that after I give myself the same. Done. Although it took me a while to actually live it, I took these words to heart beginning the middle of the year when I would have normally just given up. There were setbacks that would have ordinarily made me pull back, but instead, I reminded myself I WAS IMPORTANT, TOO. 2. I will get rid of 5 items everyday to unclutter my life. I tend to hold on to things longer than I should — and although I don’t consider myself to have had a deprived childhood, I am always thinking something worth throwing can become something or be used for another purpose later. I’m always afraid that I might regret throwing something away. End result: Clutter galore. I have so far succeeded in starting one step at a time — trying to find things to put away or throw away when I sit at my desk at the start of a work day, and at home as I end it. I have to work on this this year, as I barely got off the ground. Hence, it’s making a come back in this year’s list of To Dos. 3. I will be more organized and be less of a pack rat. Although related to the previous one, being organized is different from uncluttering. I’d like to be more efficient at work by going back to practices I had gotten used to before and by trying to keep things in order. First is the need for just one calendar to keep all relevant dates (like the school calendar, birthdays, etc.). 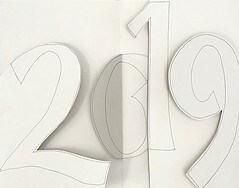 In the past, I had kept separate calendars and ended up getting confused and not being able to see everything together. Thanks to the iPhone I now carry, I’m hoping to keep that all under control. Same with notes and addresses. I also want to create a hardcopy address book — another project in the making. 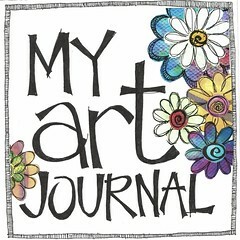 I want to see my journals all lined up and ready to pick up when I have an entry to write. I want to have my art supplies — particularly the ones I use for jewelry making — more organized. Putting them in individual organizers by plating (gold plated, antique brass, sterling silver, polymer clay) is a start, but because of the size of my stash needs a better approach. 4. I will try and learn to let go and forgive. I am human, but I tell myself I was created to be better than just being one. The past two years have been challenging and painful, and while I keep hearing that letting go and forgiveness will help me move forward, it hasn’t been quite easy. Forgiveness is another journey that I must make, and while I can see my destination, I am trying to figure out how best to get there. I want to be able to let go so that if something ends up hurting me, I wouldn’t be hurt as badly because I am holding on to that loosely. I don’t want to hold it too loosely to let it go, though — just not too tightly that it would end up feeling like losing such a big part of me if it ends up not being meant for me. There are many things that 2014 taught me, and while I had the best of intentions writing what I had written above, things turned out very differently. And yet, as I mentioned in one of my year end posts, I have learned to give forgiveness — more for my benefit than the one forgiven — and it has been instrumental in helping me move forward. 5. I will save more. My best motivation is to think more of myself. With what I make, I should be comfortable and I’m getting there. I want to be financially independent and to get back into sound economic shape. I want to be ready for any eventuality and to be able to fend for myself money-wise. I had a moderate degree of success in this regard but I intend to keep working on it in 2015. 6. I will reopen and pursue my entrepreneurship with passion again. My life seems to have been in suspended animation for the last two years, leaving one of my personal accomplishments on the sidelines, withering away. This year I promise to work more earnestly on my crafting and in selling my work through my Etsy Shop. For starters, I’m reopening the store this week, even with just ten pieces for sale. I am reworking my packaging and marketing, and will be gearing towards improving my craft by taking classes along the way. I will try to do at least two fairs to be able to sell to the public directly, but not after feeling more confident about my work. I also need to figure out if jewelry making is really the niche I want to attack or should it be papercrafting? Should it be something else like repurposing or upcycling? My heart and resources are really into jewelry making but I need to focus and begin again, and I hope that I can get this off the ground in the first 100 days of 2014. I tried. I guess there were just too many distractions in 2014 that kept me from focusing clearly on things beyond myself, and I am hoping that having regained my footing at this point in time, 2015 will enable me to reboot the store. 7. I will try to read more. I am reading more right now and have committed to read the entire Bible in one year. I also hope to finish the books that are just floating around my Kindle app from Steve Jobs’ biography to the latest from Grisham. I am saddened that Tom Clancy is now on the other side, but I managed to enjoy Robert Ludlum despite his being gone, too. I know I am starting to sound like a broken record because this is the one “resolution” or “to do in the coming year” that has appeared year in and year out on my lists. It has been frustrating that I haven’t had the chance to even get to a level of “can do” or “will do” but it is a forever wish to be able to just immerse myself in reading as much as I can. I’m hoping the History courses and the required readings, some of which are good non-fiction and not necessarily textbook materials, will actually help me move on and accomplish reading the six books for 2015 I’ve set as a goal. 8. I will do more personal art. My projects had lain dormant and unattended and are now being resurrected with a newfound zest to express myself. 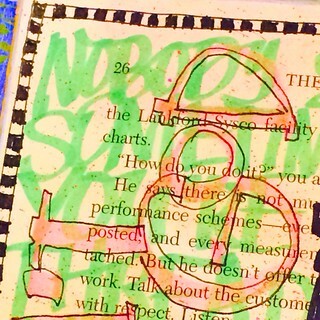 I have words, phrases, sayings I want to see executed in mini-canvasses. I was inspired by the works for sale in the previous iteration of the Shops in Bryant Park this Christmas 2013. One of my more ambitious ideas is to be able to produce a set of postcards I can sell to benefit my chosen causes. I am seriously considering studying producing limited edition postcard sets from amateur photographers, particularly young Filipino camera enthusiasts whose talent need showcasing. While I did a lot of personal art compared to 2013, 2014 saw a lot of “starts” that are still ongoing and will hopefully find fruition and conclusion in 2015. 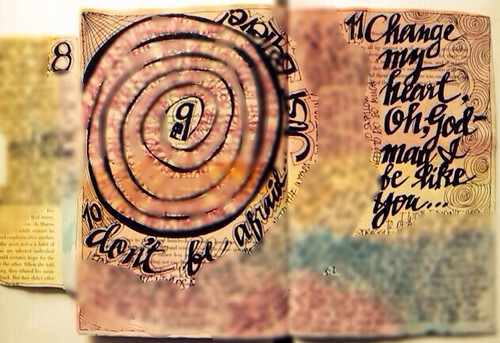 This has been a true source of comfort and therapy, and I hope to continue with my altered book (now including 2015), and maybe even begin a new one sometime in the year. I’m taking it a page at a time, and I’m quite happy with the progress I’ve made. Again, I say I’m not an artist. I’m a crafter. No pressure. It’s all for my own self-expression. 9. I will be more thankful and celebrate life again. I am not quite there yet, but throughout the time I was being harshest on myself, I found hope in counting my blessings. I learned to appreciate what I had in the face of what I thought I didn’t. I guess it is what has helped me to be strong in the face of what seems like a huge chunk of my life being taken away from me, because I still felt there was something I had been given. I have mourned, I have cried, I have wallowed in sadness and heartbreak. I have to force myself out into the sunlight because I cannot let life’s disappointments get the better of me. I will try and write my Five Things to be Happy about/Thankful for list more often as a constant reminder of my blessings. I will celebrate life myself without waiting for others to celebrate it with me. It is an acknowledgment of the blessings I have received, and the blessings others have given me. While my Five things list has wallowed in limbo and has popped in and out throughout the year, I’m going to start a weekly reminder on my calendar to make sure I stop and write that list sometime during the week in 2015. 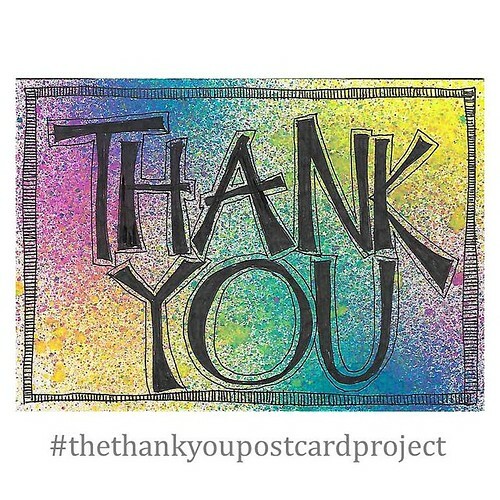 I can, however, say I have made strides in being more thankful, even if my Thank You Postcard Project is still in the works. 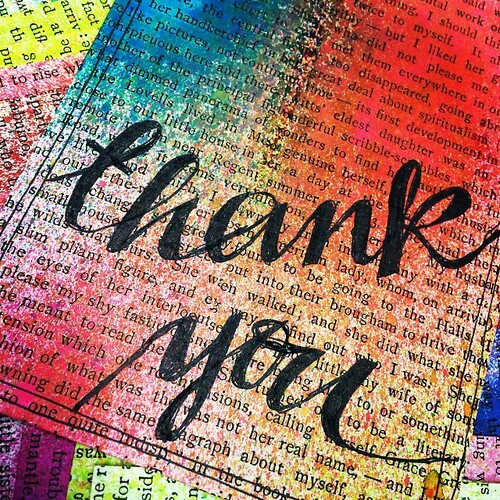 I have made a pronounced effort to thank others directly by way of a note, an email, a text message (particularly during Thanksgiving), Instagram, a phone call, or a longhand letter when I can. And I don’t just say Thank you — I write a note explaining why I am saying thank you and what it means to me. Sometimes it freaks people out, but I’d like to think I’m paying it forward. I know how it is to be appreciated and acknowledged, and I’m hoping it spurs the ones I thank with the grace to thank others who make a difference in their lives in return. 10. I will strive to stay healthy and become more fit. I managed to lose 20 lbs in the latter half of 2013 and I hope to lose even more in the next 6 months and get healthy. As I grow older, I’ve realized that taking care of my body is becoming more of a necessity rather than an option. Otherwise, my body parts might just start conking out on me. 11. I will share more of my time and resources. I really prefer to give than raise funds but when the need is great, I don’t hesitate to put my name out there and ask for donations. I have come to discover that although my own financial resources may be limited, I have a way of asking people that makes them want to give. I did that for a friend who was trying to raise money for the victims of Typhoon Yolanda, being a native from Tacloban herself, and with one appeal and less than 38 hours, we raised $500, my measly donation included. Coming from a third world country that is always in need even during its best days, I have realized my blessings are abundant enough for me to give more — not necessarily moneywise, but there are other ways to make a difference, and I’d like to make a difference in 2014. I tried raising money for my mother’s annual Christmas party for the poor folks in her hometown of Barangay San Vicente in Bulan, Sorsogon, but the effort came a little late. I promise to do better in 2015. However, I did send my contribution which was enough to cover the party and allow the children a decent holiday party. 12. I will put my “teacher” hat on. When I was in law school back in another lifetime, my classmates liked getting what we called case digests because they were good summations of otherwise long and complicated cases. When a plot was too complicated, I’d take to the board and explain in simpler terms. I also had a gift for giving textbook like definitions I pulled from context and stock knowledge. It wasn’t that I was a genius, I just had this knack for explaining things without thinking you knew what I already knew. My class is all but one person whose little brain I am trying to mold like my own, knowing he has the smarts and the aptitude and even more than I possessed. My first debacle is learning American History in earnest, and the fact that it’s his favorite subject doubles the pressure on his poor mom. (Me!) I also want to teach him cursive writing which is not offered here. I have started already, trying to prepare my little guy for the Statewide tests happening in April. I know I can do this, and I WILL do this. 13. 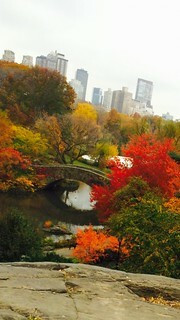 I will enjoy New York City and do something “New York” at least once a month. I have been a New Yorker for almost 14 years now, and I’ve been thankful that whole time to live in one of the greatest cities in the world. It is not lost upon me that both for Americans and the world outside our borders, New York City is THE destination to see. Unfortunately, living here has made it ordinary despite its being extraordinary. I wish I could do more to explore this wonderful city and I intend to do that from hereon. Visit new places — like trying new things and new restaurants, even on my own. Enjoying a play or two.. watching a concert once a year.. and maybe one day making it to the Opera or to Lincoln Center to watch the world renowned New York City Ballet. I tried to do something towards the end of the year but my life has been constantly in flux. I have put this on my 2015 list again and will hopefully be more successful and deliberate this coming year — actually accomplishing something. Watch out for my updates so we can keep track together. 14. I will be more fervent in my pursuit of a closer relationship with God. It’s not just because I believe that we are never truly down and out — that when things seem to be at its worst, we receive or are blessed with something good or even greater. Through the worst of times, I am forever grateful that I have never felt closer to God, and I have never felt his presence stronger in my life. When I asked a question, he answered clear as day. My journey in this respect is far from easy. And I take that as His way of showing me that this is the most important relationship in my life because it is what takes the greatest amount of work. While it may be the hardest to be good at, it is the most rewarding in the end. Countless times, I found myself crying and lost in anger and pain — and the only thing that gave me comfort was the thought that He was holding my hand through it all. I want to keep working at being a better person, and a more deserving daughter to Him. It is such a struggle given all that I am going through, but I know I will make it because He is there with me. I have tried and continue to try.. and will keep trying. Sometimes we want to think that we can easily do something we so badly want, but our human nature intervenes and keeps us from doing just that. But my faith has never waned, even when my heart was ready to throw the towel in. It has kept me going through all the challenges I faced in 2014, and it is what I’m looking to to keep me moving forward this coming year. So how did you do against your list, if you had one? Thank you postcards are here! We’ve all heard it said that we should count our blessings and see how fortunate we are rather than dwell on the glass being half empty. One of my favorite singers from back home even wrote a song — a Christmas song, at that — about counting one’s blessings instead of sheep. Each postcard will be numbered, signed and documented on the project web site. I am still trying to decide whether I will use a generic scan code for the project (which, I already have) or if I will generate one per piece (which seems daunting as it is!). The postcards are already in my Flickr gallery for you to view and I will write a blog post on the first set in my craft blog, Gotham Chick before the weekend is over. So what’s the whole point of the project? The test run is really very different from what I’m trying to do with the Thank You Postcard Project. For the test run, I thank YOU. For the project, I want to help you thank someone else. (At least that’s how the project has shaped up.) Is it a social experiment of sorts? In a way, yes. But plain and simple, it’s just a pay-it-forward kind of project to help spread some good will. It MIGHT yet finally get off the ground! All excited this Halloween Friday, and hoping I can get the back layout finalized. 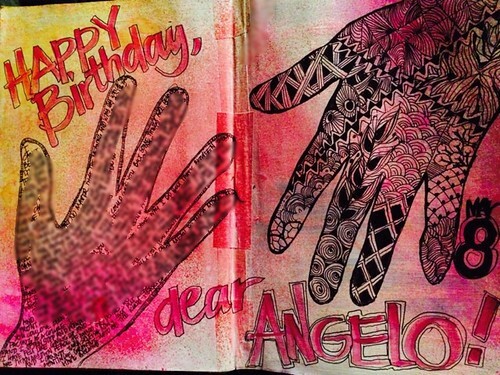 If not, I can always doodle and zentangle it for the first set. They are, after all, the very first pieces going out. Now, which one to keep? I do it when I get the chance, and I’m surprised that I’ve covered so much ground. I did this layout just before I left work yesterday. 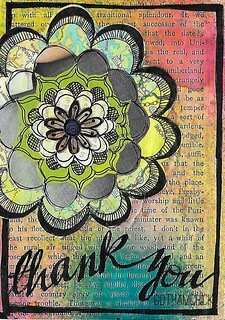 At first I meant to do collage letters or paper embellishment “THANK YOU”s. Then I started doodling again and then doing my block lettering. I’m lucky to have a nice penmanship, but I haven’t quite gotten the hang of actually rendering it as wordart until now. As always, all it takes is practice. As you can see, I still need to do one more pass, at least, to fill in the gaps within the lettering. The background is a collage of at least 2 pieces from a vintage book (read: almost 100 years old) I got for a song at Strand’s. 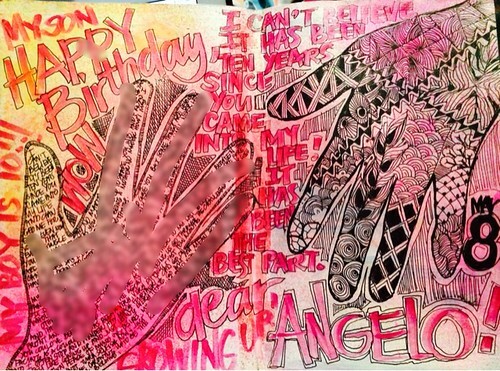 It was a little difficult working with it because the paper is literally crumbling. You cannot fold it anymore as it will just break at the crease. Once done, I will seal this with a coating of Mod Podge Matte Finish or it will never get to its destination! I haven’t quite gotten the project off the ground. I was hoping to do this update on the blog for the project (see badge on the right or click here), but I wanted to make that blog all about the project, while this space is all about me. Sometimes I grab a stack of the cards and I just can’t stop. 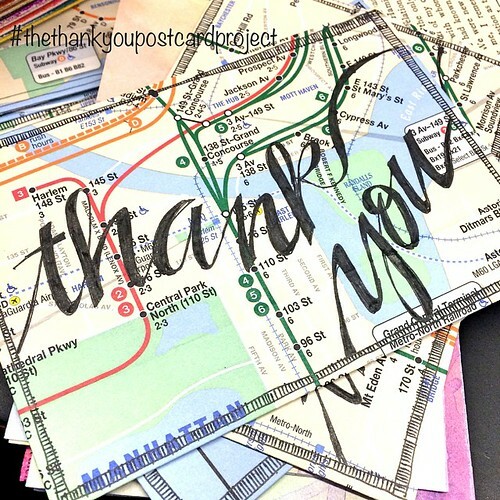 Whether it is doing the borders around the Subway Map background layouts, or doodling the actual “Thank you” on them, it has a hypnotic effect that keeps me going and going. Even just drawing those lines on the border can be very relaxing. I usually stop only because my lunch hour is over or because my hand has started to hurt. I remember reading about a then teen-age actress back in the 80s and she used to say she would color with crayons on kiddie coloring books to pass the time between takes during shoots and to destress. We all self-soothe. Many of us do it in unconscious ways but for some, we seek the comfort or calm we want to have in very deliberate ways. Mine has been writing and personal art. It has been helpful. And I often find it amazing to see how my work has progressed. I don’t claim to be an artist. I’m a crafter. I often get lost in the daily grind. Work has its own rhythm and I can get going from the beginning of the day to the end juggling things and trying to finish the tasks I’ve been assigned. Time can fly by when you need more of it. And when the break hits me, I stop and try to do something specifically “FOR ME”. Whether it is to browse my favorite websites for inspiration or to just go through one of my magazines.. or maybe even create one of my digital postcards to post on my Instagram page for the project. I push the negative thoughts away. Those thoughts that bring pain and confusion and anger. I try to dwell on the positive. Scribbling and doodling brings me there. We all have our own ways of coping — I’m trying to stay on the positive side, even if I sometimes can’t help but thinking perhaps there’s something to drinking the blues away, or some such other resort. But the thing is, I don’t enjoy drinking, for one, so the thought of the headache and maybe spilling my guts out when I get inebriated keeps me from going that route. It looks like a nice day out. I started the day with my buttered toast and jam breakfast. And mind you, it’s no ordinary jam. I finally relented to opening my last bottle of Mountain Maid Strawberry Jam from the Religious of the Good Shepherd convent in Baguio from last December’s visit. (If you’re visiting from Manila and you ever think of me, please bring me a bottle… precious, precious jam! I only use one teaspoon each time.. trying to stretch it.) Such a savory treat that brings me a taste of home..
I’m seeing my stylist for a hair cut.. the boy needs one, too. Errands to be done today — and just relaxing. It’s one of the last holidays we’re getting for a while, so we’re trying to make the most o fit. I can’t believe the quiet. The boys are in the room. (Coolest part of the house.) Can you believe summer’s gone? We will officially be into fall soon. Where did the time go? That’s a thought that makes me truly thankful. 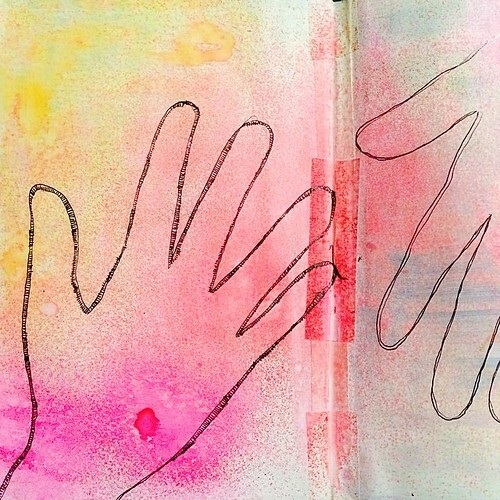 My journal entries are very raw and frank that is why while I used to share my journaling openly, I’ve opted to blur the journaling this time around. 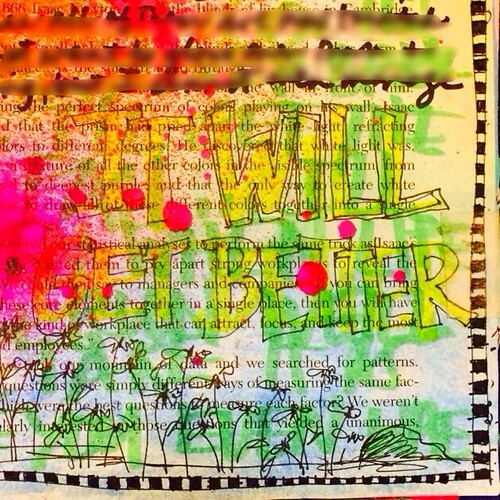 I’ve also used my entries to encourage myself to move forward and be more optimistic. For the most part, it’s a continuing effort. But at the end of the day, just seeing the entries that are already done gives me a sense of accomplishment. To me, it’s a very concrete manifestation of physically moving forward which helps me motivation-wise. 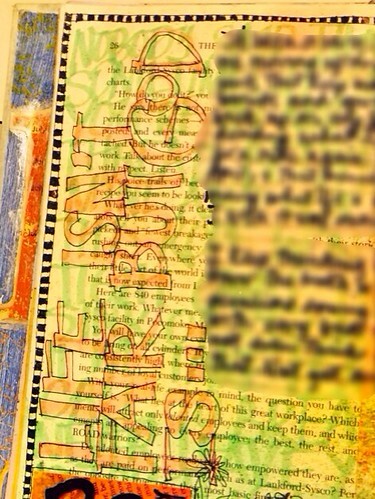 Here’s a layout that I rendered by doing layers of text. First, there’s a highlighter background rendering of the lyrics of a favorite song of mine by Rupert Holmes, “Touch and Go”. There are two main lines here (totally unrelated to the song) but they are really visible only when you look closely it have the book in your hands. 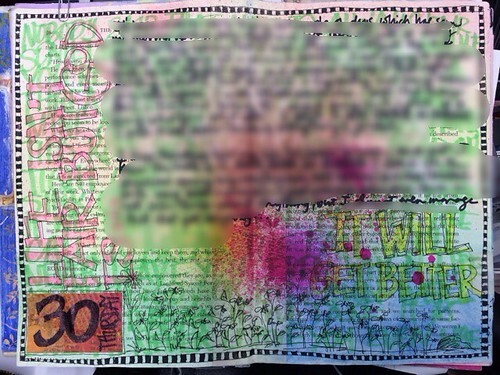 It’s very busy but that was the whole point of layering the texts with minimal drawings. 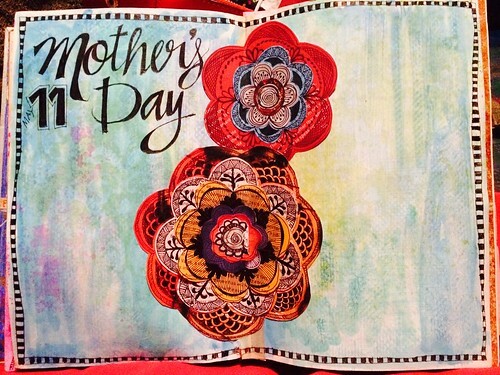 I had started doodling these type of flower scribbles when I was in high school and haven’t really used them in any layout so I did on this one.